Last year, Rhode Island auditors found a big problem in the small state's $2.6 billion Medicaid program. Its two Medicaid managed-care insurers, Neighborhood Health Plan and UnitedHealthcare, were getting overpaid—by a lot. Like 30 other states and the District of Columbia, Rhode Island has expanded Medicaid under the Affordable Care Act to people who earn up to 138% of the federal poverty level. And like 38 other states and D.C., Rhode Island pays private insurers monthly lump sums to provide health coverage to the state's poorest residents. But last year, auditors discovered Rhode Island's Medicaid agency overpaid Neighborhood Health Plan and UnitedHealthcare a combined $208 million, or about 8% of the Medicaid budget. Most of the erroneous payments stemmed from a faulty estimate of costs for newly covered Medicaid beneficiaries, who wound up using fewer medical services than anticipated. Rhode Island clawed back about $75 million and expects to recoup most of the remaining funds this year, giving credence to the effectiveness of its audit process. But it is one of only a few states that have instituted effective Medicaid managed-care auditing programs. Regulators say the vast majority of states spend most of their time auditing fee-for-service claims instead. For those that haven't, “the managed-care organizations are unintentionally benefitting from a significant and extended no-interest cash-flow infusion,” Dennis Hoyle, Rhode Island's auditor general, wrote in his report. In a scathing 2014 report, the Government Accountability Office said more oversight was needed. The government's oversight agency suggested the CMS require states audit payments both to and by private Medicaid insurers. “Unless CMS takes a larger role in holding states accountable and provides guidance and support to states to ensure adequate program integrity efforts in Medicaid managed care, the gap between state and federal efforts to monitor managed-care program integrity leaves a growing portion of federal Medicaid dollars vulnerable to improper payments,” the GAO's report said. The Obama administration responded last week by issuing a final rule for oversight of Medicaid managed care. Regulators and outside auditors will now put more Medicaid insurers under the microscope to ensure federal and state taxpayer dollars are not wasted—the central reason that states moved to managed care in the first place. A new federal rule will encourage states to ramp up auditing of Medicaid managed-care insurers, many of which keep their medical spending hidden from public view. Some companies will emerge as bigger targets than others. UnitedHealth Group, the parent of UnitedHealthcare, which was tagged for excess payments in Rhode Island, and a number of other major insurers keep their Medicaid medical spending hidden from public view. A suggested medical-loss ratio may now force those payments into the open and help state officials set their rates for insurers. “All states are focusing even more attention on auditing as the costs associated with Medicaid programs increase, and increase at a faster pace than state revenues,” said Suzanne Bump, Massachusetts' state auditor. Last year, her office found that Massachusetts' Medicaid program made more than $500 million in unnecessary, duplicative payments to providers. Instead of faulting the state's six managed-care companies, though, Bump placed nearly all of the blame on the state's flawed claims administration processes. The federal government and states spent $496 billion on Medicaid in 2014 for more than 70 million adults and children, with the feds covering 62% of the tab. For-profit and not-for-profit private insurers handled more than a third of the money, according to GAO estimates. Spending is projected to explode in the coming decade. 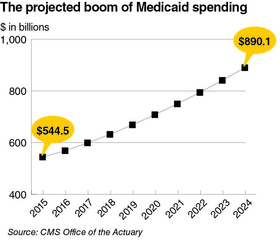 The CMS estimates Medicaid spending will reach $890 billion by 2024, a potential gold mine for insurers. Insurers certainly are bringing in more Medicaid revenue since the ACA's Medicaid expansion took off in 2014, according to financial filings. The per-person capitated rates that states pay are vitally important because they are partially based on how much spending the companies report. “That notion of actuarially sound rates is really what you have to watch in any state,” said Cindy Ehnes, a former California Medicaid regulator who works as a consultant for COPE Health Solutions, which works with providers and health plans. And as the Washington state auditor's office said in a 2014 review of its Medicaid plans, states could pay unnecessarily high premium rates if carriers inflate their spending figures. That's where the medical-loss ratio comes into play. MLRs show how much of the capitated premiums are being spent on medical care and “quality improvement activities.” The CMS finalized instituting a nationwide 85% MLR standard for Medicaid plans, which will put Medicaid in line with Medicare Advantage, individual and employer plans that are already required to clear minimum MLRs. However, there's no penalty for not meeting that mark, and states have a lot of latitude in actually establishing MLRs into their rate-setting. A few publicly traded insurers with large Medicaid managed-care programs provide a clear view of how they spend their Medicaid revenue. Those that have opted for transparency show operations well within the bounds of what the CMS wrote into stone. Centene Corp.'s MLR for basic Medicaid programs was 86% in 2015 and surpassed 90% when factoring in high-cost populations such as older Medicaid beneficiaries who are blind and disabled and those who need long-term care, according to filings with the Securities and Exchange Commission. WellCare Health Plans had a spending ratio of 89.8%. WellCare is still settling a legal case over past executives who faked the company's loss ratios. A 2015 Milliman study of 2014 results found the average Medicaid MLR across 182 companies was 86%. Molina Healthcare, a Medicaid insurer based in Long Beach, Calif., has some of the most detailed Medicaid financial data of any health insurance company. The company breaks down monthly Medicaid revenue by state and by Medicaid population and prominently features its MLR, which was 89.1% in 2015. “What we have always tried to do is be aware we are the stewards of the taxpayers' money,” said Dr. J. Mario Molina, Molina Healthcare CEO. The company also conducts its own internal audits. “It's a very different perspective from commercial-focused health plans. They are more focused on their commercial members than Medicaid,” he said. Four of the nation's large commercial insurers—Aetna, Anthem, Humana and UnitedHealth—do not disclose specific MLRs for their Medicaid plans in their public filings despite their massive Medicaid footprints. UnitedHealth, for example, operates in about two dozen states and recorded almost $29 billion of Medicaid revenue in 2015. Each company declined an interview request. Medicaid spending is most opaque at Aetna and Anthem, which are acquiring Humana and Cigna Corp., respectively. Those two insurers report their Medicaid membership and how much “government” premium revenue they collect, but neither company outlines how much revenue they specifically receive from state Medicaid programs versus Medicare, in addition to not providing Medicaid MLRs. Aside from pushing for an 85% MLR, the CMS' Medicaid rule will require states to conduct or farm out audits of their managed-care plans at least once every three years. The estimated cost per state will be about $240,000 a year, a pittance compared with the millions of dollars in potential overpayments or erroneous claims that can be collected. But state officials told the GAO in 2014 that insurers aren't keen to “identify and recover” inappropriate payments. There are two main reasons for this: First, the GAO said, insurers don't want to be viewed as susceptible to fraud and abuse. Second, if insurers do report and return improper Medicaid payments, the state may reduce capitated rates in future years to recoup the overpayments. Indeed, 18 states and D.C. have a minimum Medicaid MLR requirement, nearly all of which set the floor at 85% or higher, according to the Kaiser Family Foundation. And as Molina, Centene and WellCare have shown, most of their spending exceeds those marks. “Eighty-five percent is not troublesome at all to us,” Centene CEO Michael Neidorff said. Centene, which just completed its acquisition of Health Net, is more than willing to pay back state and federal governments if it spends less than expected, he said. In fact, it already has. “We have written checks in Texas between $70 million and $100 million, which I think says we are very high quality, and we're being efficient,” Neidorff said. Centene and Molina's willing acceptance of a federal MLR differs from the view of the industry's main lobbying group, Medicaid Health Plans of America. Jeff Myers, CEO of MHPA, criticized the 85% MLR as “duplicative” and “arbitrary” because many states have their own MLR standards. Other states write in specific ratios when they award contracts. “It ignores how contracting is done,” Myers said. Small, not-for-profit Medicaid plans worry the new federal MLR will penalize them for having wildly variable spending patterns from year to year. Imposing a nationwide standard could also create a “race to the bottom,” said Paul Tufano, CEO of for-profit Medicaid insurer AmeriHealth Caritas. Will plans that already operate above the 85% threshold see an incentive to spend less on medical care and more on administrative costs and profits? Myers said more states, such as Iowa and North Carolina, are moving to Medicaid managed care because of budget predictability, and they're not “just willy-nilly throwing money at insurance companies.” And insurers expect a more rigorous auditing process in the contracts they sign. “It's actually pretty complex for the managed-care organizations to comply,” said Ehnes, the former California Medicaid regulator. “They understand a really robust regulatory environment and have adapted to that if they are successful.” But, she added, more attention is needed on how plans reimburse hospitals and doctors. Medicaid agencies—and by extension, managed-care companies—notoriously pay rates well below the cost of providing services. Plans note that the capitated dollars do more than simply pay for healthcare services, though. Steve Ringel is the Ohio market president at CareSource, a $6.7 billion not-for-profit insurer that derives a vast majority of its revenue from Medicaid. He said the MLR today also represents spending to tackle the social determinants that affect Medicaid patients. For example, many CareSource members are less concerned about getting a checkup or procedure and more concerned about getting their kids to school or finding a new place to live, he said. Spending money to manage those social issues is now a mainstream view of how to improve healthcare and salvage Medicaid funds long term. CareSource's statutory MLR in 2015 was 84% but rose to 91% after factoring in taxes and those types of quality-improvement costs. AmeriHealth Caritas is a for-profit company. An earlier version of this story described it as not-for-profit.